An Adoption Program that helps match orphaned dogs and cats with forever families! The goal of every adoption is to find a loving, forever home for the dogs and cats at our Soffer and Fine Adoption Center. 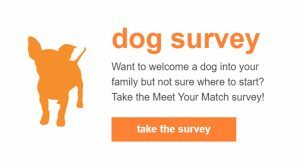 Meet Your Match® is a program of ASPCA — which includes a Canine-ality and Feline-ality behavior assessment of each pet and a brief survey of each adopter. The process results in a color-coded matchmaking system that brings compatible companions together. It helps our counselors match the expectations and lifestyles of YOU – the adopters – with the behaviors and personalities of the dogs and cats. When adopters visit the Soffer and Fine Adoption Center, they fill out a brief survey. 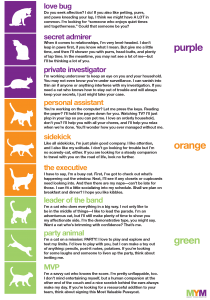 This helps us gauge their expectations in a pet and determine what type of pet would be best suited to their home. 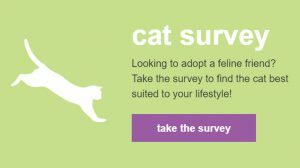 Adopters may also complete the survey online by clicking here! Once the survey has been completed, our adopters receive a color-coded guest pass to guide them in finding their new companion. 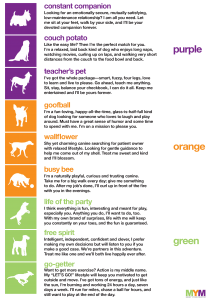 All of our pet adoption cards are color coded by their canine and feline “alities”. Adopters don’t have to choose a dog of matching colors as love at first sight does happen, too. Knowing the dog’s color, however, now lets the adopters prepare for the way their new furry friend will respond when he or she gets home. In addition to the regular adoption counseling, the adopters receive access to an online booklet guide to day one and beyond with their green, orange or purple dog. There is a perfect, furry match out there for everyone. Learn more about the nine unique personalities of canines and felines that await you at our shelter. Don’t forget to check out our adoptable dogs here! Don’t forget to check out our adoptable cats here!